For ages, circuses were the prime—or only—form of entertainment for entire communities, particularly those in rural areas. In Ancient Rome, chariot races took place in oval arenas (anything to do with horses takes place in oval or circular structures; ‘circus’ is a Latin word stemming from the Greek ‘krikos’, meaning ‘circle’ or ‘ring’). In Medieval times, clowns, musicians, trick riders and acrobats began to travel with the horse acts; also at this time, tents were erected over the ovals. North America’s first circus was started by a Philadelphia man in 1793. Three years later, the first elephant was brought to America and the collection and exhibition of exotic animals became popular. This practice is, of course, now considered to be cruel and déclassé (and has been eclipsed by sophisticated acts such as Canada’s Cirque du Soleil). The Golden Age of circuses began in the 1870s, by which time they included brass bands, fancy costumes and eye-catching graphics for advertising purposes. Lavish parades announced each troupe’s arrival, with the circus rolling into town in ornately decorated wagons and gilded cages. 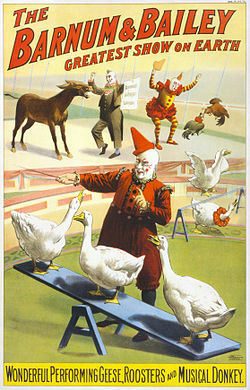 Circuses were mobile communities, including performers, trainers, production people, barbers, costumers, teachers, doctors. They lived and worked in their colourful caravans—often, entire families stayed with the same circus for generations. The Golden Age came to an end in the late 1920s. A short time later, circus historian Gordon Potter hired Michigan miniaturist Bert Backstein to construct a miniature model of a circus as it really was. Half a century later, Backstein’s son completed the collection (now known as the Potter Backstein Collection and owned by Vancouver businessman Bob Moore). 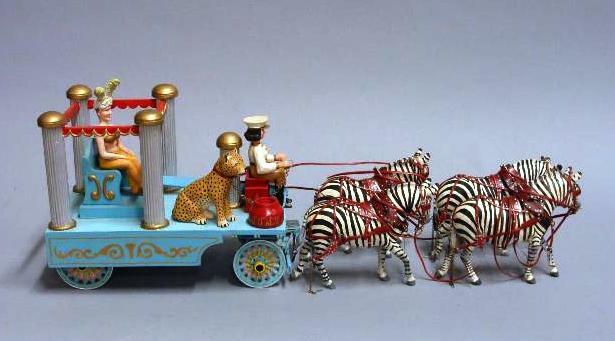 The collection’s components are slightly larger than the standard one-inch-to-one-foot scale, and consist of 250 wagons, a 400-piece menagerie of painted ceramic and wooden animals, and 125 carved and painted circus performers, band members and workers. Half of the wagons are miniature replicas of actual Ringling Brothers and Barnum & Bailey Circus wagons from the Golden Age; others are replicas of wagons from the renowned Hagenbeck Wallace Circus (1907-1938).